Melissa has yet again created a superb lactose-free meal for lactose-intolerant sufferers like me using Lactaid milk and shared it at yesterdays Today Show with Kathie Lee and Hoda. She made Chicken in Creamy Mushroom sauce and she got me at mushroom! Being able to enjoy your meal or favorite drink without the nasty side-effects of ingesting dairy is truly liberating! It's like a breath of fresh air. You get to truly enjoy your meal the way every sumptuous dinner should be -- or in my case, my favorite blended coffee drink! 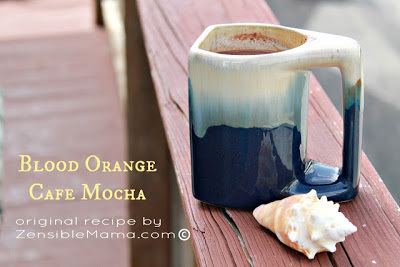 I recently created my own version of my favorite drink Cafe Mocha using Lactaid Milk and enjoyed it tremendously. It was inspired by sun, sand and sea! I'll say it again that I'm glad to know that there is an option for milk that works without the side effects! My tummy is happy. I'm happy. Though still waiting for a coffee creamer Lactaid-version! :-) Thank you to Lactaid for giving Lactose-intolerant sufferers a new chance with dairy and for giving me the chance to try their product myself. Only, sufferers like me, will truly understand and appreciate the impact of this product and the difference it makes to one who is sensitive to dairy. If you're in the same boat, I'd say, it won't hurt to try it! +Lactaid through The Motherhood provided the Lactaid product for me to try out. This is part of a compensated project unless otherwise stated. All other opinions are ours.